Very simple. This is East 86th Street, looking East from Fifth Avenue. Central Park is immediately behind the camera. The main challenge in processing was to get the light correct, so after applying the Pro Contrast filter that I’m now using on almost every image, I brushed in both the High Key and Low Key filters from Nik Color Efex and also used the Darken/Lighten Center filter. I sometimes see a similar view to this when I come out of work in the evenings. It can make my day. Great shot, Mark! Fantastic shot Mark! So many great colors, and terrific vanishing point into the sun. Great shot!! You’ve created energy without motion. 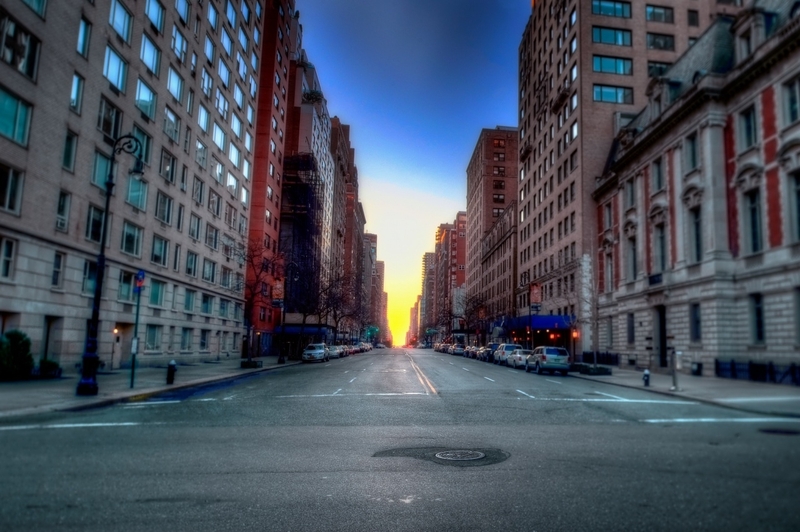 I want to jog down the middle of East 86th Street towards that beautiful light! Well done, Mark! Wow! Really like this shot, Mark! Awesome job! Wow, that is beautiful. Great job at avoiding traffic. Thanks Justin. If you get up early on a Sunday and are willing to be a little patient, you can usually get a shot like this in most sections of the city.